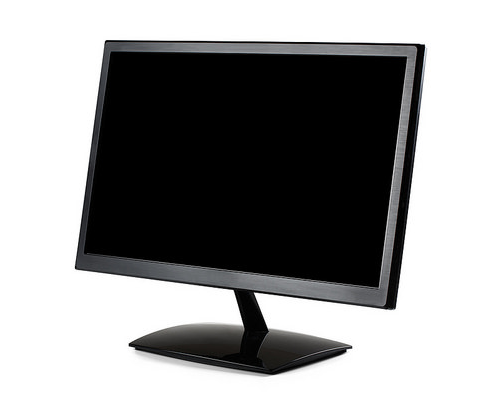 Monitors located too far or too close may cause you to squint or lean back, leading to eyestrain and neck pain. • Sit at a comfortable distance from the monitor where your eyes and the monitor are about 20-40 inches apart. You should be able to comfortably view the screen with your head and back in an upright position. • If there is not enough desk space, consider moving the desk away from the wall, or switch to a flat screen monitor which would require less desk space. • Install an adjustable keyboard tray that allows you to sit further from the desk and add more space between you and the monitor. Tilting your head up or down to read the monitor may result in fatigue and neck pain. • Set your monitor directly in front of you so your head and neck face forward. Monitors should not be more than 35 degrees to the left or right. • Elevate your line of sight by raising your chair. Be sure that you have adequate space for your thighs under the desk and that your feet are supported. Staring at the screen for too long may cause eye strain and fatigue. This is also known as Computer Vision Syndrome or Digital Eye Straing. According to a 2015 survey by The Vision Council, 65% of American adults reported suffering from digital eye strain. Users also tend blink less while viewing the monitor. • Rest your eyes periodically by focusing on objects that are farther away (for example, a clock on a wall 20 feet away). • Look away frequently and blink at regular intervals to moisten the eyes. • Alternate duties with other non-computer tasks such as filing, phone work, or customer interaction to provide periods of rest for the eyes. Monitors that are tilted up or down might make it hard for the user to read text. Furthermore, when the monitor is tilted up, overhead lights may create glare on the screen. This can result in eyestrain and fatigue in the neck from sitting in an awkward posture. • Tilt the monitor so it is perpendicular to your line of sight, usually by tilting the screen no more than 10 to 20 degrees. This is most easily done if the monitor has a riser/swivel stand. A temporary solution involves tilting the monitor back slightly by placing a book under the front edge. Note: Computer monitors should be periodically cleaned and dusted.